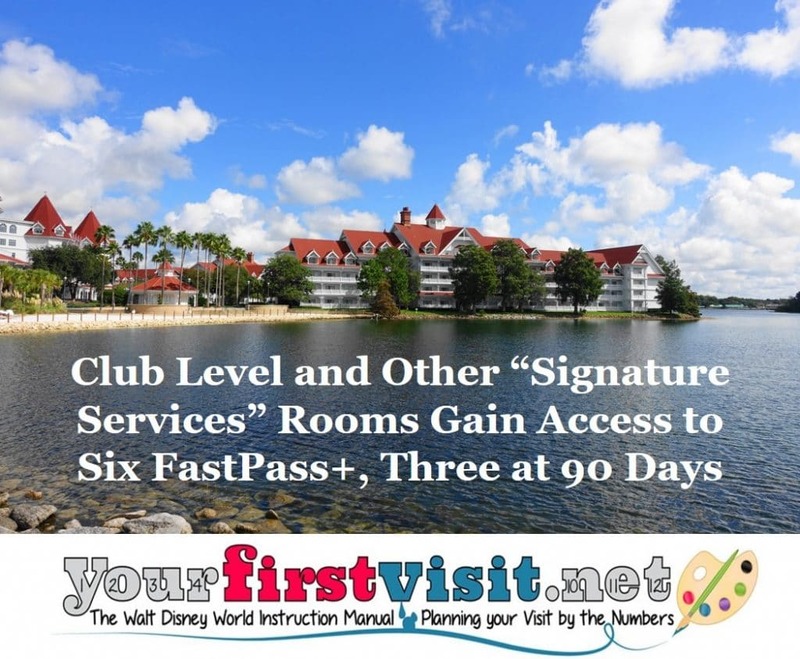 Word emerged last week that those staying at the “Disney Signature Services Level”—basically, Club Level, suites, and deluxe rooms at the deluxes, and the Bungalows at the Polynesian Village and the Cascade Cabins at the Wilderness Lodge—will have the opportunity, for trips beginning March 13 and after, to pay extra to book three additional FastPass+ per day, starting 90 days before their check-out date. These additional FastPass+ can be at any tier, and—if you have a Park Hopper ticket—in any park. Besides requiring the Signature Services price level (which can be spectacular compared to the least expensive options in these resorts), in addition folks using this deal will need to pay an extra $50/person/day for at least three days of their Signature Services level stay. The three “extra” FastPass+ are booked directly through the Disney Signature Services staff, beginning 90 days before check-out. The additional regular three FastPass+ are available at 60 days before check-in via My Disney Experience, just as usual. The three extras need to be for three different rides, but it is unclear, so far, whether you can then double up on these with your three regular FastPass+. Stay tuned to this thread (and especially this post) on DisBoards for further clarity as this trial program unfolds. In addition, your $50/person/night (and Club-level premium) gets you reserved space (one per night) at special viewing areas at Happily Ever After, Rivers of Light, IllumiNations, and Fantasmic. I’ve stayed club level at the Beach Club and Contemporary multiple times each, and also at the club levels at the Polynesian Village and the Wilderness Lodge. In all cases but one, this was not by design—rather, I either had to get into a room at one of these hotels for a review and had put my booking off until only club level was available, or was upgraded into such a room. I’ve always been skeptical about the value of these offerings, especially since I typically otherwise book lowest-cost-view rooms (except at the Animal Kingdom Lodge). Essentially, their distinctive offer is free drinks and free food, and I don’t drink enough—no, really—to get much value from the alcohol, and find the food too hit-or-miss to be able to count on it as a meal substitute. So I don’t commonly pay the premium, which can be over 60%, nor have I historically much recommended it. For example, in most of May 2018 the lowest cost view room at the Wilderness Lodge is between $442 and $487 per night. A club room there the same dates is $704 to $807—about a 65% premium. At the Grand Floridian, the main building club offering these same dates has the same 60% premium over its lowest priced rooms (outer building club rooms in Sugar Loaf Key are less expensive than the main building rooms, and show “only” an average 30% premium then). You can figure out the difference yourself for your dates on MouseSavers.com by following the links here. But for those already paying for club level—or for a standard room at one of the higher theme park-view price points who are willing to shift to club level instead—the upgrade to this offering may be well worth it. 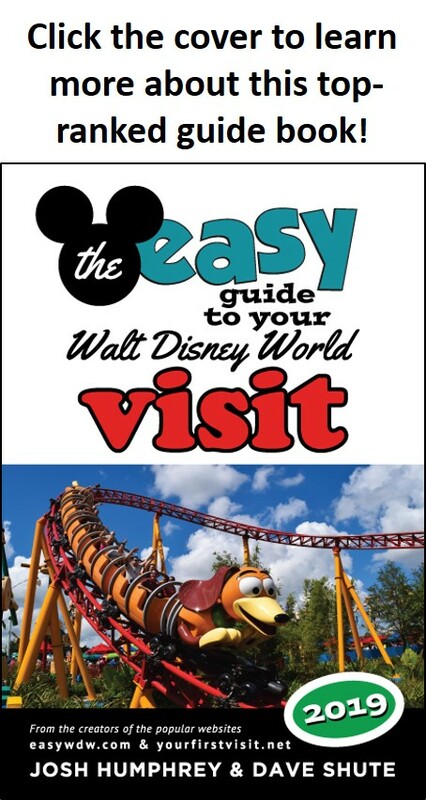 Judicious use of the extra FastPass+ could both save you a day or two of your visit (especially at Epcot, Animal Kingdom, and Hollywood Studios), and/or save you from having to get up early, and make accessing the hottest FastPass+ at Flight of Passage and Seven Dwarfs Mine Train much more likely. The value of these extra 90 day FastPass+ will only increase after Toy Story Land opens, and even more after, god help us, Star Wars Land opens. There’s also real value to the reserved viewing area at Happily Ever After in particular, and for some at the other three evening shows. If true, this means that the “extra” FastPass+ will come out of stand-by capacity, not previously established FastPass+ capacity. But not, perhaps, as much capacity as you might think—at least for now. For example, about 90 club level rooms, deluxe rooms, and suites at the Beach Club will be eligible, about 68 at the Contemporary, and about 130 at the Polynesian Village (including the Bungalows). …unless the number of Disney Signature Services rooms expands. The Disney Signature services rooms, right now, are of three types. First, there are the club level rooms, typically on their own floor and with a lounge on that same floor; second are the suites and deluxe rooms, which can be anywhere (there’s 20 of them at the Beach Club that are not on the fifth floor where the club rooms are); and third, at Wilderness Lodge and the Polynesian Village, there’s the Bungalow and Cascade Cabins, out away from everything else along the water. Given that Signature Services already extend off the dedicated club floors, and that most of the club level rooms themselves are no different than standard rooms at their respective deluxe, I can think of no logical reason why Disney can’t simply make a room on a different floor a Signature Services room. So room 3024 at the Wilderness Lodge, most of the time a mild-mannered third floor woods view room, could be booked either as such at its regular rate, or for an extra 60% plus $50/person/day, put on its superhero outfit as a Club-eligible room with six FastPass+. I’m not saying this will happen. But I am saying that it can. As Disney continues to scheme ways to monetize the popularity of Star Wars and other rides it will be opening in 2019 and beyond, without necessarily plunking down the capital (and timelines) required for a lot of new hotels, I would not at all be surprised to find many more rooms to be bookable as Signature Services a couple of years from now than can be booked today. If you are interested in this trial, and your visit is March 13 or later, Kelly B can book it for you. You can reach Kelly at KellyB@DestinationsInFlorida.com or 980-429-4499, or use the quote form below. I see this as being the same problem we have with people booking campsites to get fast passes, then cancel the res. and keep all the fast passes for the week. Disney has to get organized and connect this, so that the fast passes are cancelled when the res. is cancelled. There are always people who work the system.